If you saw my post on The Face Shop - Mask Haul, then you would have seen just how may masks I received, and how many I get to try out! I was super excited the same day I got them, so I just couldn't wait to try one out. 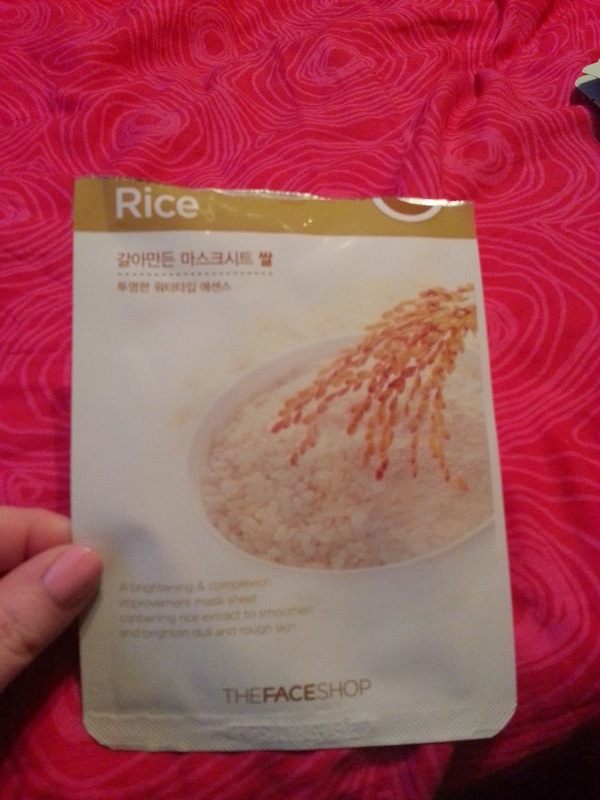 My first pick was the Rice mask! Rice - A brightening & complexion improvement mask sheet containing rice extract to smoothen and brighten dull and rough skin. If you own any of these masks, then you know how heavy they feel in the packaging. I ripped into mine and I could tell that there was a lot of liquid... this is called nutritional essence. It provides natural moisture and nourishment to the skin. Once I unfolded the mask - which I had a hard time with since it kept sticking to itself lol... I managed to get it onto my face. I made sure to push it down so it really got into my skin. As you can see, the mask is quite large. I think I got it on okay for my first sheet mask ever! I have to say it was highly saturated with essence, but it didn't drip like I thought it might. 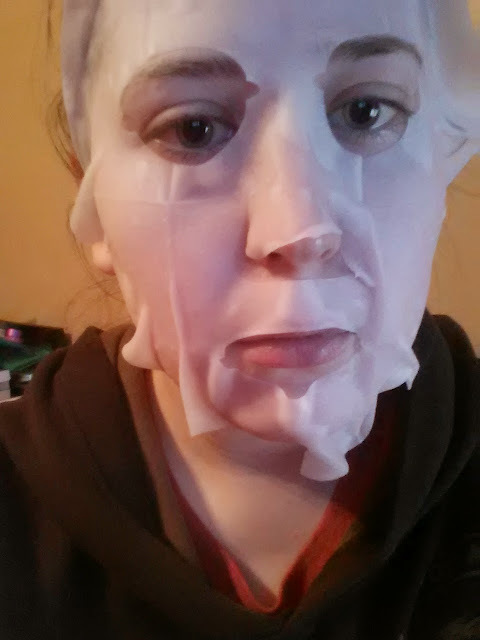 The mask itself is really soft, and didn't cause any irritation. Once I let it sit for about 12 minutes (the package recommends 10-12, but I see a lot of people post online saying 20 minutes) I slowly removed it from my face, and made sure to tap my skin lightly so it would absorb the leftover essence. After I felt it had dried enough, I put on some eye cream, then some vitamin e cream. I found my face stayed sticky for quite a few hours afterwards. I'm not sure if it's because of the essence, or the mixture of the essence with the vitamin e cream. I did it later on in the evening anyway, so it wasn't a big deal. Two days later, and I have to say, I am super impressed. My skin still feels moisturized and hydrated, from the inside out. It doesn't feel tight like it sometimes gets. 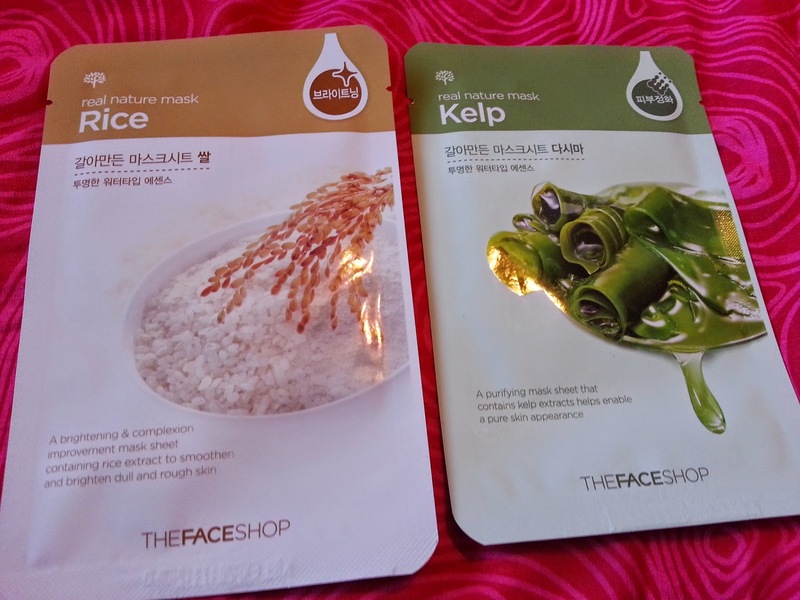 I'm so excited to try more sheet masks from this line!